These services will enable the athlete to maintain an optimal quality of life beyond their BC High athletic career. The BC High Athletic Training Staff is composed of Athletic Trainers who are board certified by the National Athletic Trainers’ Association (NATA), are licensed by the Commonwealth of Massachusetts, and are under the direction and guidance of the Boston College High School team orthopedic physician. Supplemental healthcare providers include Athletic Training Students (interns) and a host of medical consultants and sub-specialists. We are committed to the ongoing evaluation of our Athletic Training Department and its protocols, so our student-athletes can be assured of the highest quality of medical care. The student-athlete is responsible for reporting all injuries, however minor, to the Athletic Training Staff as soon as possible. We will evaluate, determine the course of treatment, and make the proper referral, if necessary. To make injury reporting convenient, the student-athlete and their parent(s)/guardian(s) can complete the “Report Injury Form” and request an evaluation using their ATS account. Injuries or illnesses sustained outside of a BC High Athletics season or during an extracurricular activity must be reported to the Athletic Training Staff at the student-athlete’s earliest convenience using their ATS account. If the student-athlete is seen by a physician, the Injury Referral Form (located under the eFiles tab on ATS) must be completed and returned to the Athletic Training Staff by email, fax, or in person. The BC High Athletic Training Staff will not assume responsibility of care for injuries that occur outside of a BC High practice or game. This includes town and club activities. Reporting of any injuries, however, is mandatory. Arrive on time and the days determined for treatment and rehab. Receiving treatment or rehab is not an excuse for tardiness to practice or games. If you are unable to make your rehab day or time, please email the Athletic Training Staff at your earliest convenience. Wear clean and appropriate clothing for treatment (T-Shirt and workout shorts). If you are not dressed appropriately, you will be asked to come back the next day. If a Home Exercise Program is assigned, you are expected to complete the program at home. Follow the Participation Status of the Athletic Training Staff. The Athletic Training Staff determines the need for taping. Taping will not be done if a student-athlete fails to report for rehab. Any additional support needed after completing rehab must come in the form of a brace that the student-athlete and their parent(s)/guardian(s) are responsible for. The final decision of a return to BC High Athletics participation rests with the Athletic Training Staff. The consistent failure of a student-athlete to follow treatment and rehab recommendations will be interpreted as an unwillingness to cooperate with the Athletic Training Staff for the earliest return to participation and may result in the student-athlete being ineligible to participate in all BC High Athletic Department activities. The Head Coach and Athletic Directors will be informed of the Athletic Training Staff’s decision. Concussions cannot be seen; however, in a potentially concussed student-athlete, one or more of the signs and/or symptoms may become apparent and/or the student-athlete “doesn’t feel right” soon after, a few days, or even weeks after injury. Concussions are taken very seriously at BC High as they can affect a student-athlete’s ability to succeed in the classroom and complete daily tasks. Most student-athletes with a concussion get better and return to participation, but it is important to allow time for their brain to heal. What should student-athletes and parents do if they think someone may have a concussion? Immediately notify the coach, Athletic Training Staff, and/or school nurse. This can be done through the student-athlete’s ATS account. Be evaluated by a licensed healthcare provider who is familiar with current concussion management. Submit all required documents to the Athletic Training Staff. This can be done in person or through the student-athlete’s ATS account. Give the brain time to heal. While a concussed brain is healing, it is much more likely to have another concussion. Repeat concussions can increase the time it takes to recover and may cause more damage. 1. The Post Sports-Related Head Injury Medical Clearance and Authorization Form must be completed by the treating physician, submitted, and reviewed by the Athletic Training Staff. This form is available and can be submitted under the eFiles tab through the student-athletes’ ATS account. Return to play is determined with consultation from the Boston College High School neuropsychologist and team physician. 3. It is the BC High Athletic Department’s Policy that a student-athlete complete a minimum of 1 day of full practice before game eligibility. 4. The final decision of a return to BC High Athletics participation rests with the Athletic Training Staff. 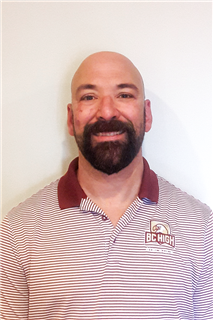 Steven Medeiros is in his 17th year at BC High and is the Head Athletic Trainer. Is certified by the NATABOC and licensed by the state of Massachusetts. 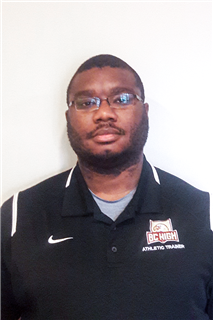 He oversees the Athletic Training program for all BC High athletes, which includes injury prevention, evaluation, and rehabilitation. He is also an ImPACT trained athletic trainer (ITAT) for the evaluation, treatment, and recovery of concussions. Mr. Medeiros is a clinical prefect for Bridgewater State University and Boston University Athletic Training programs. He has taught a Sports Medicine course at UMass Boston, has worked with minor league baseball and with arena football. He graduated in January 1998 from Bridgewater State University with a Bachelor of Science degree in Athletic training. A native of Norton, MA he currently resides in Bellingham with his wife Michele, his daughter Maggie, and their dog Hailey. He enjoys motorcycling, all Boston Sports teams and is a long time Patriots season ticket holder. Anthony Wright is in his first year as Assistant Athletic Trainer. He oversees the day to day operation of the Athletic Training Program, student-athlete rehabilitation, and assists the Head Athletic Trainer with administrative duties. Wright comes to BC High with clinical experiences ranging from NCAA Division 1 to semi-professional sports to outpatient physical therapy. His experiences have allowed him to treat and rehabilitate Olympic, professional, and collegiate athletes. Most recently, he was the Head Athletic Trainer for St. Joseph’s Preparatory (Brighton) and Randolph High Schools. Wright is a 2009 graduate of Bridgewater State University with a Bachelor of Science degree in Athletic Training. As an Athletic Training Student, he established a stable clinical foundation at several colleges and high schools, including Bryant University and BC High. Wright is licensed by the Commonwealth of Massachusetts, certified by and is a member of the National Athletic Trainers Association (NATA). He also holds certifications as a Corrective Exercise Specialist and Functional Movement Specialist. A native of Boston he currently resides in Easton with his fiancée, Kathleen, and their cat, Raja. As part of our ongoing commitment to the health and safety of our athletes, BC High is excited to announce its affiliate relationship with Boston Children’s Hospital Division of Sports Medicine. A sports medicine priority phone line available Monday through Friday, 7:30 a.m. – 4:30 p.m.
Access to a Saturday Urgent Sports Medicine Clinic at 319 Longwood Avenue, 6th floor, Boston, offered 9am-3pm September through May. Access to FasTrac, a free phone app that provides fast and direct phone and email access to Boston Children’s world-renowned experts when you need a sports medicine appointment. To learn more about Boston Children’s Hospital Sports Medicine programs and injury prevention please visit bostonchildrens.org/sportsmed. With locations in Boston, Lexington, Peabody, Waltham and Weymouth, specialized care is always within reach. FasTrac is a phone app, so be sure to view this web page on your phone when downloading the app. Working together with BC High’s certified athletic trainers Steve Medeiros and Anthony Wright, and school physician Dr. Joseph Chase, our neuropsychologists at Sports Concussion New England www.sportsconcussion.net provide specialized telemedicine consultation to review and analyze neurocognitive test results for preseason baseline and postinjury testing with ImPACT. We have worked closely with the BC High athletic department since 2007 and are available to consult on every ImPACT test administered to every student. Our goal as part of the school’s clinical team is to help ensure that all concussion injuries that may occur are managed to the highest standard of care.